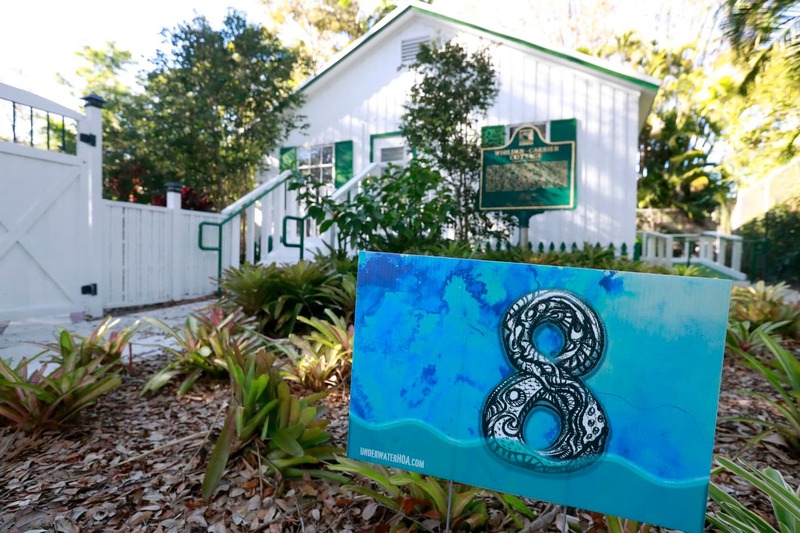 In this Wednesday, Feb. 6, 2019 photo, a yard sign stating that the area is eight feet above sea level is shown in front of artist Xavier Cortada’s studio in Pinecrest, Fla.
Cortada repurposes “for sale” signs, painting partially-submerged numbers that announce exactly how many feet above sea level each property is, for people to plant in their front yards. A growing number of members have signed on at underwaterhoa.org since Cortada launched the idea in December. Cortada’s signs show his home is on relatively high ground: 6 feet (2 meters) above sea level. His studio is at 8 feet (2.5 meters). Cortada’s signs feature his swirling paintings of melting Antarctic glaciers. Other neighbors have made their own. Students also painted the elevations of four intersections — 6, 7, 9, 11 feet (2, 2.1, 2.75, 3 meters) — along the city’s two-lane main road, which Cortada dubs “Elevation Drive.” It runs along what constitutes high ground in South Florida — a narrow coral ridge that appears to stay dry when models of sea level rise show much of the region inundated. Some residents aren’t happy about these art installations, warning on a community newspaper’s website that the painted signs and pavement could devastate property values.